Data gathered through this study will assist in the preservation of the pallid sturgeon and may hopefully lead to its down listing. Bureau of Reclamation Commissioner Brenda Burman announced that Reclamation is providing $45,000 to the Montana Fish, Wildlife and Parks to continue a study of how Reclamation's projects are affecting the endangered pallid sturgeon in the upper Missouri River above Fort Peck. "Data gathered through this study will assist in the preservation of the pallid sturgeon and may hopefully lead to its down listing," Commissioner Burman said. "The study’s data provides information on the evaluation of pallid sturgeon reproduction conditions, the collection of habitat data measurements and a more complete data analysis." Through the life of this agreement, Reclamation anticipates providing more than $200,000 to Montana Fish, Wildlife and Parks. They are maintaining a radio-telemetry monitoring system located within the 200-mile study reach and organizing the data. They are also manually tracking and locating radio-tagged fish once per month from April to October. Montana Fish, Wildlife and Parks has already received $90,000 and has confirmed the spawning areas, radio-tagged all fish captured not containing previous tags, and monitored and tracked fish located in those areas. 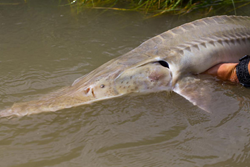 Learn more about the pallid sturgeon on the Montana Fish, Wildlife and Parks website.